Centric is proud to offer our own brand of NGLI-2 extreme pressure lithium grease. 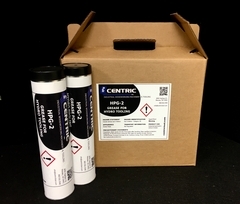 Centric brand of NGLI-2 extreme pressure lithium grease is called HPG-2. HPG-2 has many applications across several diligences. NGL-2 is used in industrial, automotive, and mining industries. The majority of our woodworking customers use HPG-2 grease as a pressurization medium to secure tooling. Paired with a Wanner high pressure grease gun customers can concentrically secure Hydro-Loc moulder heads; which are also available through Centric Inc. HPG-2 can also be used in plain/rolling-element bearings in: compressors, fans, centrifugal pumps, chassis parts, U-joints, water pumps on passenger cars, track rollers, commercial lawn mowers, general-purpose/shop/industrial grease, underground mining machinery, crushers, vibrating screens, centralized lubrication systems. The benefit of HPG-2 lithium extreme pressure grease is that it is formulated with special additives to perform well under extreme pressure and heat. HPG-2 grease is a “catch all” lubricant. You can use HPG-2 lithium extreme pressure grease to lubricate tracks, rollers, feeders, bearings, and many more applications. Centric HPG-2 extreme pressure grease is top grade lithium grease. Centric NGLI-2 grease HPG-2 extreme pressure grease is amber in color and has a buttery texture. HPG-2 has an operating temperature of -30° to 250° F. Centric HPG-2 lithium grease comes in 14oz tubes that are packed in a case of 10 tubes per case.